A small, thin device that will capture biometric data from a person's finger. I think this is a pretty good prediction of an item that is commonplace today. He took out his wallet and aimed its lens first at Spivey and then at the man's glowing credential. Quickly he dialed the private security service he used for such things and pressed his thumb to the ident-plate. In three seconds the tiny screen flashed a terse confirmation. These are now available on a variety of laptop computers and even small, pocket-sized PDAs. 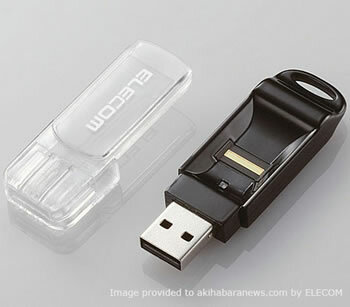 Take a look at this tiny USB key with a fingerprint reader; the CR-FP2 and CR-FP3 USB keys have a sensor with a with what is described as 1/10000000 precision. The CR-FP3 has 512MB of memory and weights 11g.